im going to write this blog based around fact number one from my 100 Things list. that’s nice, huh? im also going to change my writing style for this entry. i usually dont write like this. i used to write like this on aim in middle/high school except my font used to be pink (fuchsia, really) because i wanted to be a living statement of a contradictory male/not scared to venture into new grounds. look at the picture. i tried to look a little hipster. the glasses are fake; my sister says my mommy got them from delias. the camera is my panasonic lumix zs3. the hoodie is my orchestra hoodie when we went to carnegie hall in 2005; i ripped it because that was the trendy thing to do. 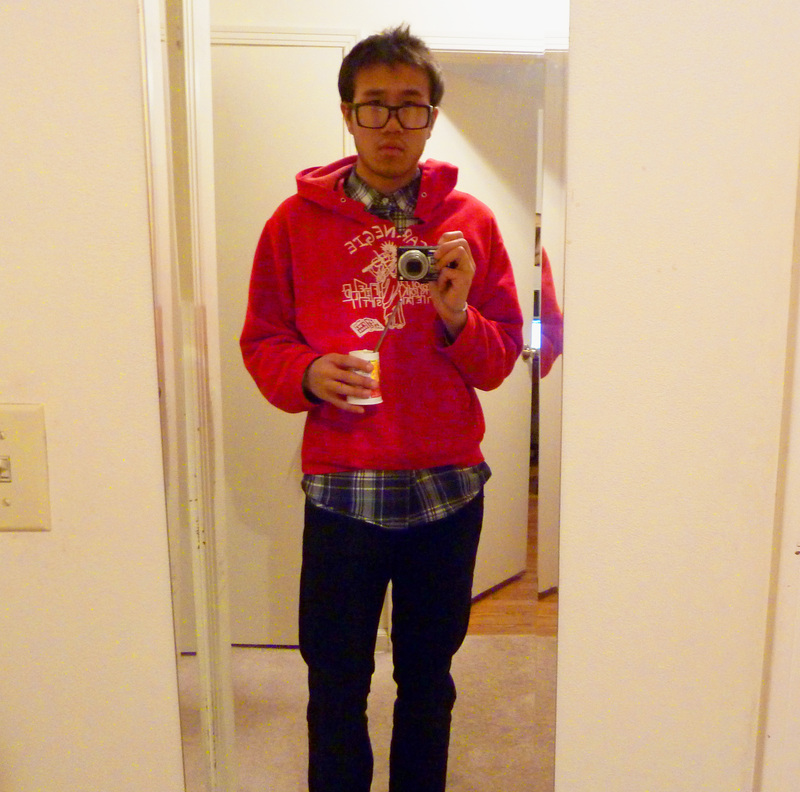 the button up underneath the hoodie is from the gap and was on sale; it is purple and plaid, and i like both of those. the pants are skinny black jeans from target; i wear them to work a lot because i cant wear blue denim at work. the yogurt is parfait pineapple and there is a spoon in the yogurt. the spoon is the reason i am blogging. i hate putting my lips on silverware. even if the utensils are plastic, i will probably never kiss them with my lips. in this sense, my lips are completely virgin because i am nbk. i dont know if i will ever want to be kissed/kiss a girl until my wedding day. you might think this is weird, and i think youd be right in thinking that because it is a little weird. i might not do that, but i might. i still have time to decide on this because i dont have a girlfriend nor do i envision one in the near future. being nbk until my vows might be like a revival of the fuchsia in a different form. i usually use a plastic spoon to eat this yogurt, but it seems my mommy has gone green and no longer purchases plastic spoons. so i used the spoon my sister always uses. it is large and obtrusive; i do not like how it feels in my hand, and i certainly do not like how it feels around my mouth. it has made this yogurt experience somewhat undesirable. i think i dont like to put my lips on utensils because i am somewhat of a germophobe. i was probably scarred as a young child when i watched my grandparents and parents wash the dishes. they would use the same silverware that i used to dig into the flesh of fish and other odd laotian foods. even if they washed it, i couldnt get myself past the grim history of those forks and spoons. this entry was inspired by the yogurt found in the family fridge, and by this lady. she doesnt know that i follow her blog, but i do and i like it.